See sunrise and mountains from Kala Patthar, located 5,643m above sea level. Learn more about Sherpa culture while travelling through highland villages. Come and visit Nepal’s most popular trekking destination. Walking village to village underneath world´s highest peak. Visit the enchanting land of Nepal and see the world’s highest mountain for yourself. Enjoy spectacular views of Mount Everest from Kala Patthar (5,643m). 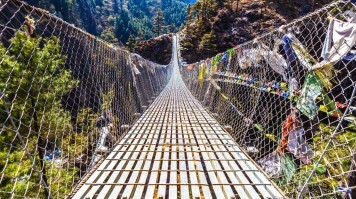 Trek to the famous Everest Base Camp. 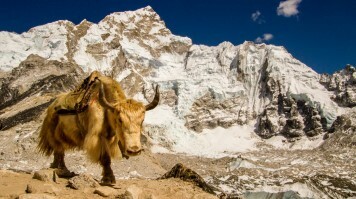 Trek to Kala Patthar peak (5,643m) for stunning views. Enjoy a full-board trekking experience with all meals included during the trek. This trip combines two of the world’s great classic treks. Get your first glimpses of the might Himalayan range on the included flight from Kathmandu to Lukla – surely one of the most dramatically located airports anywhere.. Compare and contrast the terrain of both the Everest and Annapurna ranges. Kalapathar, the most Accessible Viewpoint in the World to see Mt. Scenic Mountain Flight over the Himalayas. Namche Bazaar, the Largest Sherpa Village of Nepal. Experience a small, scenic flight to and from Lukla. Explore the Sherpa museum in Namche Bazar. Witness a panoramic view from Syangbuche. This is one of the world’s great classic treks. You’ll be accompanied by an experienced English speaking local trek leader along with assistant guides and porters, who will not only give you all the support and guidance you need along the way, but also introduce you to the rich local Sherpa culture.. The viewpoint of Kala Patthar at +5,600 meters - giving panoramic mountain views. Arriving to Everest Base Camp. Sipping tea with the local sherpas and seeing Namche Bazar, the capital of the EBC region. 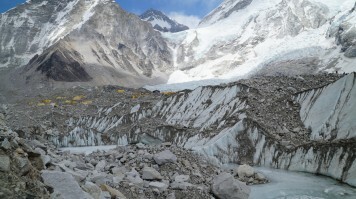 The trek to Everest Base Camp (EBC) is possibly the most dramatic and picturesque in the Nepalese Himalaya. Not only will you stand face to face with Mount Everest, Sagarmatha in Nepali language, at 8,848m (29,029 ft), but you will be following in the footsteps of great mountaineers like Edmund Hillary and Tenzing Norgay. 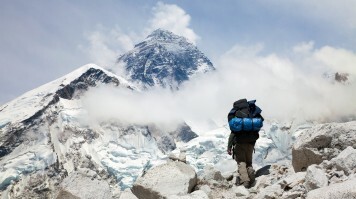 A trekker getting close to Everest Base Camp with Mt. Everest and its 8850 meters looming in the background. A view towards Everest Base Camp, where climbers are acclimatising, and waiting to make their way to the next camp up Mt Everest. Besides the superlative Mount Everest, some other prominent peaks visible during the trek include Lhotse (8501m), Makalu (8463m), Cho Oyu (8153m), and Ama Dablam (6856m). Transport To/From Trek Flight to the town of Lukla (2860m); also accessible by taking a bus to Shivalaya and then a few days of trekking up to Lukla. 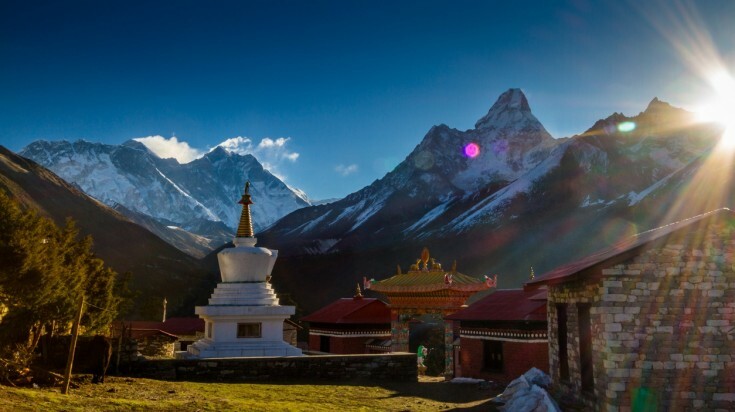 Option 1: Although the Everest Base Camp Trek is the most well-known of all the treks in Nepal, there are other alternative treks that you can take. A popular choice is the shorter Everest Panorama Trek which can be completed in 8 days. You will get to see Mount Everest and the surrounding peaks but the Base Camp itself is not part of this trekking route. Option 2: Another option is the Gokyo Trek which takes 12 days to complete and offers views of Everest and nearby peaks, Gokyo Lake and the longest glacier in Nepal - Ngozumpa Glacier. You also have the option to combine the Everest Base Camp Trek with the Gokyo Trek for a 15-day trip. Option 3: A third alternative is the combined Everest Base Camp and Gokyo Trek which takes 15 days. This trek is highly recommended, as you will both see the amazing and pristine Gokyo region as well as Everest Base Camp. Option 4: Finally, if you have 16 days available or more, you can do the amazing Everest Base Camp 3 Passes Trek, crossing the 3 passes Kong Ma La Pass, Cho La Pass, and Renjo La Pass, each of them above 5,000 meters. 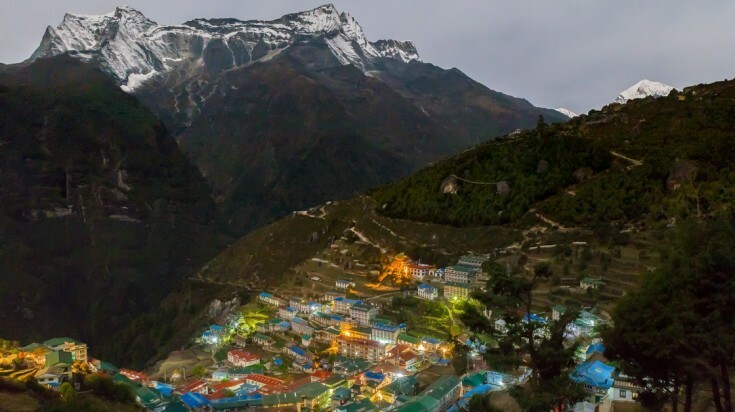 A view of Namche Bazar, the capital of the Everest region, just before the sun sets. This is a high altitude trek and therefore careful acclimatization is needed. Acclimatization days are required during the trek to avoid altitude sickness. Temperatures regularly drop below freezing around EBC during early spring, late autumn and winter. Please ensure that you have the proper gear and clothing for the time of the year. Download Trek Guide Enter your email to download a complete guide for the Everest Base Camp trek	.